American Mining Company (Michigan) stock certificate, one of only two known, issued in 1902 ($5,250). 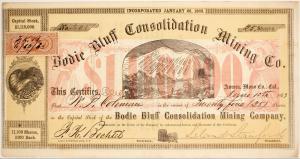 Stock certificate issued in 1863 by Bodie Bluff Consolidated Mining Company in California ($5,500). 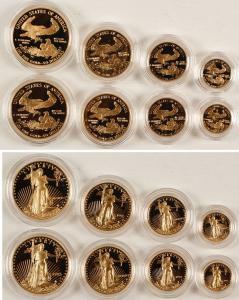 Pair of sets of American Eagle gold bullion coins, from 1991 and 1992, four coins per set ($5,423). Copper Block Buffet gold nugget token from Valdez, Alaska ($2,000). Flint glass Old Tea Cup Whiskey bar back bottle (Nevada), from the 1880s, 11 inches tall ($1,875). It was Holabird Western Americana Collections’ Cornucopia of Collectibles Auction, held October 18th through 22nd, online and at Holabird’s gallery in Reno. RENO, NV, UNITED STATES, November 5, 2018 /EINPresswire.com/ -- RENO, Nev. – Late 19th and early 20th century mining company stock certificates from the state of Michigan proved popular with bidders at Holabird Western Americana Collections’ five-day Cornucopia of Collectibles Auction, held October 18th through 22nd, online and at Holabird’s gallery in Reno. More than 3,000 lots came up for bid in an auction that grossed over $500,000. 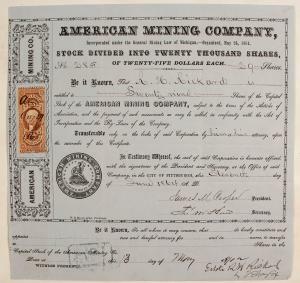 The Michigan mining certificates included examples from the American Mining Company, one of only two known, issued in 1902 to R.H. Rickard for 29 shares ($5,250); the Elm River Copper Company, issued in 1906 for 25 shares and signed by the company president ($3,000); and the Coulter Cooper Company, issued back in 1882 for 1,100 shares to a Mr. Samuel Henry ($2,500). Other Michigan mining stocks featured ones from Chicago Mining Company of Lake Superior, issued in 1854 for 100 shares to J. Sanards and showing four vignettes of men and Native Americans ($2,625); Iron King Mining, issued in 1886 for 15 shares, with a large head vignette ($2,250); and Native Copper Company, issued 1905 for 100 shares to William Banks ($2,250). All the Michigan mining stocks have interesting back-stories. The certificate issued in 1885 to Jacob Pierce, for 34 shares, was from the Pewabic Mining Company, first operating in 1853. The underground copper mine initially focused on opening prehistoric pits that traced an amygdaloid bed. It didn’t yield much, but the company did manage to pay dividends of $1 million before allowing its mining charter to lapse in 1884, when it shut down. The certificate brought $2,250. The sale’s top-selling mining stock actually came out of California. It was a certificate issued in 1863 by the Bodie Bluff Consolidated Mining Company (Aurora, Mono County), for 25 shares, to W.P. Coleman ($5,500). Interest in the certificate was boosted by the fact that it contained the signature of California Governor Leland Stanford (as well as company secretary F.K. Bechtel). Another stock certificate signed by Stanford – but not as governor but as company president – was the one issued in 1863 in the amount of 50 shares to Sylvester Byron, from the Governor Stanford Gold and Silver Mining Company ($3,375). Leland Stanford was a tycoon as well as a politician. The stock doesn’t commit to either California or Nevada, as the mine straddled both. Railroad certificates included one from the Silverton Railroad Company (Denver, Colo.), issued in 1893 for 10 shares (at $100 per share) to C.M. Hobbs and signed by company president Otto Mears ($2,750); and bond specimen #0000 for the South Pacific Coast Railway in California, for a $1,000 first mortgage 4 percent gold bearer bond, with image of George Washington ($3,375). Day 1, on Thursday, October 18th, was packed with Native Americana, posters, entertainment industry memorabilia, bronze sculptures, furniture and related items, original art, vintage and antique bottles, saloon collectibles, taxidermy, gaming items, political memorabilia, and 420 lots of bargains and dealer specials of all sorts. In all, 659 lots crossed the auction block that day. A star lot from Day 1 was a beautiful, flint glass Old Tea Cup Whiskey bar back bottle (San Francisco, Nev.), from the 1880s ($1,875). The 11-inch-tall bottle, a rare and interesting relic from the Old West, had a fluted neck and shoulder area and 12-paneled body with refired pontil. The words “Old / Tea Cup / Whiskey” were embossed in script, with slanting white enamel. Day 2, Friday, October 19th, showcased badges (26 lots), belt buckles (28 lots), numismatics (334 lots total, to include ingots, coins, currency and scrip, medals, scales and miscellaneous); jewelry (18 lots), tokens (180 lots), dies (67 lots) and minerals 19 lots) – for a total of 678 lots. Gold lots did particularly well on Day 2. Top achievers included a pair of sets of American Eagle gold bullion coins, from 1991 and 1992, with each set containing four coins and in the original government packaging ($5,423); a Copper Block Buffet gold nugget token from Valdez, Alaska ($2,000); and two 1978 gold Krugerrand dies, each one ounce designed by Paul Kruger ($1,563). Day 3, Saturday, October 20th, featured mining collectibles (691 lots, geographically sorted) and militaria (59 lots). Day 4, Sunday, October 21st, included directories, firearms and weaponry, cowboy collectibles, tools, toys, automotive stocks, checks, Gold Rush items, pens and pencils, spoons, World’s Fair and Exposition memorabilia, locks and keys, and general Americana. Day 5, Monday, October 22nd, had general Americana that was geographically sorted, foreign items, railroadiana, Wells Fargo & Express collectibles and postal history – 702 lots in total. Anyone owning a collection that might fit into an upcoming Holabird Western Americana Collections auction is encouraged to get in touch. The firm travels extensively throughout the U.S., to see and pick up collections. Last year it visited many cities throughout the country. Holabird Western Americana is always seeking quality bottle, advertising, Americana and coin consignments for future auctions. To consign a single piece or a collection, you may call Fred Holabird at 775-851-1859 or 844-492-2766; or, you can e-mail him at fredholabird@gmail.com. To learn more about Holabird Western Americana Collections, LLC, visit www.fhwac.com.